Today at 10:43 PM EST comet Lulin (鹿林) will streak by the earth. It will be within 38 million miles (0.41 AU) – 160 times farther than the moon. It is expected to be visible to the naked eye. 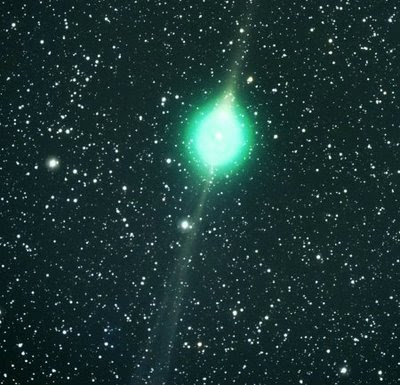 Discovered only a year ago by a Chinese teenager, the comet gains its green color from poisonous cyanogen and diatomic carbon gases in its atmosphere. While planets in our system circle the sun counter-clockwise, Lulin circles clockwise. This makes the comet appear that the tail is in front (or backwards) as it approaches the earth. Lulin came from the outskirts of our solar system from 18 trillion miles away. After it passes by earth, it will leave our solar system never to return again. The comet was discovered one summer afternoon in July 2007, when Quanzhi Ye, a 19 year-old student of meteorology at China's Sun Yat-sen University, looked at a photo that had been taken just nights before by Taiwanese astronomer Chi Sheng Lin at the Lulin Observatory of Taiwan. In celebration of this one-of-a-kind celestial event, I have named the middle movement of my Chamber Symphony Lulin.